You can achieve a lot with color and texture on your rigid heddle loom. Here are a few examples of what you do with just colors. It's important that you weave a plain balanced weave. Plain weave is over and under of every warp thread. 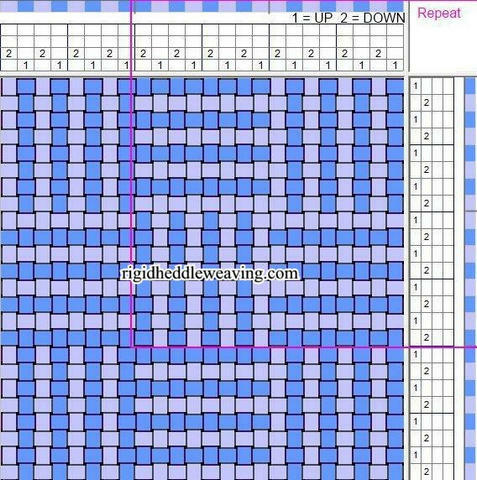 Balanced weave is when both the warp and weft threads are visible in equal amounts! Warp 2 dark, 2 light. 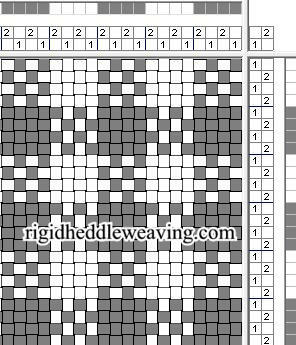 Weave: Tromp as writ (weft same as warp), plain balanced weave. 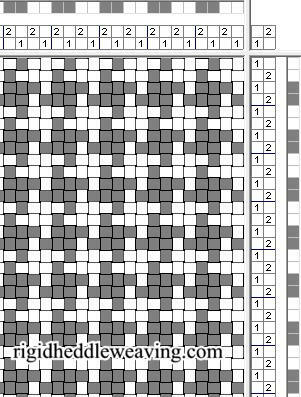 Similar to the 2/2 twill color/weave effect seen in houndstooth. This is a smaller version of that and is sometimes called "Puppy Tooth". Very easy to weave and has a lot of impact. 4 light, 4 dark, tromp as writ, plain balanced weave. Something we're all familiar with, often seen in red and white picnic table cloths and is considered a plaid. Repeating alternating blocks of [Light-Dark-Light-Dark] and then [Dark-Light-Dark-Light] (LDLD - DLDL), tromp as writ, plain balanced weave. This is a "shadow weave" and it will really wow your friends!